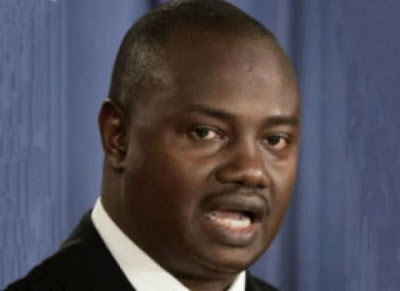 His name is Ibrahim Larmode, and until his appointment yesterday, he was Director of Operations of the EFCC, same position he held during the Nuhu Ribadu tenure. He was said to have been Ribadu’s main foot-soldier during the administration of ex-President Olusegun Obasanjo and following Ribadu's exit, Larmode had been touted to be his successor, but then came Mrs. Farida Waziri . "aaaah !" picture seems to be saying that. He looks soft...ope his got a strong heart...and i pray his going to follow in the footsteps of his friend Ribadu. time will tell if he is "the one"
Hello Mr New EFCC Boss. How are you, Ibrahim Larmode? How's your wife and shildren? Congratulation on your new appointment. We go wash am o! I wish you well. I can't think of anyone else to add. Oh, sheeeet! I'm sorry! I forgot to add you, jail Ibrahim Larmode, too! It takes a monkey to catch a monkey. Although, I'm not calling you a monkey or a pickpocket, I'm sure you know what I mean. Jail everyone in Nigeria, especially everyone in Abuja that's above 25 years of age. I swear on indomie‎, they're all corrupt. I wish you happiness, success and Goodluck (Jonathan) in your new job. He looks like he will chop money the most sef. Lmao. This is the update on the Arik Air vs British Airways faceoff. For the rest of the article on the unfair and racist British Airway, please follow the link on this comment. Please, ignore the stupid waffle in paragraph 1 and 2 of the link and start reading from paragraph 3. "The Nigerian government has, uncharacteristically, since gone beyond the retaliatory slashing of British Airways' slots from seven to three in the Lagos-London Heathrow route to looking at the differences in fares charged passengers flying from Ghana and Nigeria by the British carrier. It was for instance revealed that while the cost of a First Class ticket from Lagos to London (one-way) is $5,408, the same seat from Accra to London is $2,399. Similarly while a Business Class ticket from Lagos to London (one-way fare) is said to be $3,685, the same seat from Accra to London is reportedly $2,049. The suspicion is that the differential pricings on the same higher-end seats is aimed at luring the niche passengers from Nigeria to fly to London through Accra because such class of seats are not being sufficiently patronized by Ghanaians. In Nigeria, the British carrier has apparently no problem with the demand for such higher-end seats. The way the Minister of Aviation, Mrs Stella Oduah, handled the issue forced British Airways to offer a 20 percent reduction on this class of seats in its flights from Nigeria. But the Minister rejected the offer, saying the British carrier must offer the same or similar fares from Nigeria to the UK as is the case in any other equidistant destination within West Africa. This is a very commendable nationalistic stance." ehn ehn Oga Lrmode, abeg dont listen to dat kemikal oooo, na real CHEMICAL she be. seh wan poison ur mind. me i have a different list of pple i want u to jail: ANYONE & EVERYONE in POWER. Fingers cross, i pray he's the heartless enforcer that Naija needs. The moment this guy arrest Obasanjo and IBB, i'm leaving America for Naija straight. Kemikal and Veronica u guys are just making my day. he looks like a crook!!!! Hope say him don dey find new job cos dem type him sack letter as dem dey type him appointment letter....no b naija we dey? !...al he has 2 do is step on som power monger's foot! They are birds of the same further. Expect nothing valuable from them, even if they do, they are nominate by the higher theives and were control by the so call criminal leaders. He is often referred to as the spare tyre that can never be used for too long. He is also not qualified to be the EFCC boss, but can only be on an acting capacity. Except he gets promoted by the President just like Obasanjo did with Nuhu Ribadu. Wait for the next man. Who wore it better? Bleona or Susan?